Finding efficient ways to fit birding into business travel has me on the hunt for ideal locations as close to airports as possible. So far, my two favorites have been Jamaica Bay right down the road from JFK and Arrowhead Marsh practically connected to the car rental lots at the Oakland airport. Now, to add to this collection, I’ve discovered a clutch little coastal area just a stone’s throw from LAX! I recently had the opportunity to pursue some Southern California birding with my friend Sherry of Conservation Calling. Sherry is among that breed of entrepreneur who seeks to align market success with social good. Since nature is her cause and, pardon the pun, calling, she and I had much to discuss as we surveyed the secret sites of Los Angeles birding. I can now attest that the waterfowl at Kenneth Hahn State Recreation Area are as nonplussed by photographers as I’ve come to expect on the West Coast and further that Franklin Canyon Park seems like an auspicious slice of chaparral, grasslands and oak woodlands between the San Fernando Valley and Beverly Hills. However, our best birding lay along the Pacific Coast. If I had to offer a criticism of A Birder’s Guide to Southern California, it would be that its treatment of Los Angeles birding is rather skimpy. Nonetheless, the author does highlight two interlinked birding treasures: Ballona Wetlands and Playa Del Rey. Playa Del Rey is the beachfront community sandwiched betwixt Los Angeles International Airport and the Pacific Ocean. That might make this zipcode less desirable to residents repulsed by the incessant drone of airplanes overhead, but it doesn’t seem to bother the birds. 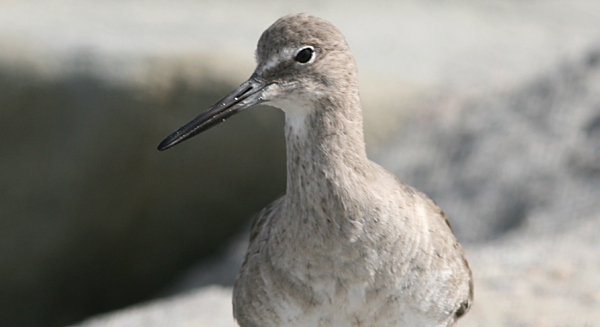 Gulls like Western, California, and Ring-billed were quite common along the sandy shore, as were Willets. Offshore bobbed scores of satisfied Western and Eared Grebes mixed in with Bufflehead and Surf Scoter. The real action here can be found around a network of jetties you’ve probably seen from above when flying from LAX. 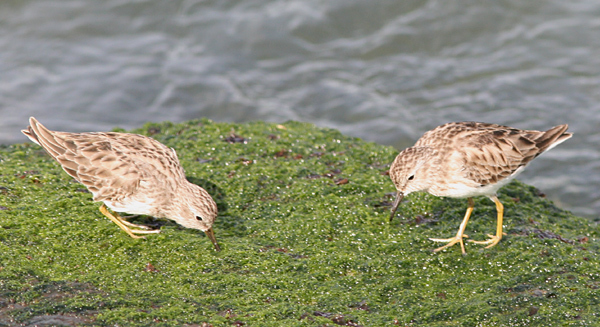 The rocks close to shore sheltered communities of Least Sandpipers, Black Turnstones, and Surfbirds. Further out, the big breakwater standing between Marina Del Rey and the sea supports a community of Brown Pelicans, gulls, cormorants, and who knows what else. I don’t know because I didn’t have a scope which explains why I was able to confirm Brandt’s Cormorant but not Pelagic. Not only did Playa Del Rey offer more interesting birding than any unbroken stretch of Pacific sand could, the neighborhood pond served up some bonus prizes in Del Rey Lagoon Park. Here I saw an abundance of Greater White-fronted Geese along with the most perfect opportunity to compare Canada and Cackling Geese imaginable. Picture if you can a lone Canada Goose (that should be easy) gliding across the surface of a pond. Now enter this goose in a synchronized swimming competition partnered with a bird only half its size. When the Canada and cackler match each other stroke for stroke that closely, every difference between the two stands out. From the bill profile alone, it was a cinch to separate them from at least a hundred feet away. Too bad this doesn’t happen more often. The Ballona Wetlands, perhaps the last significant coastal wetlands area in the Los Angeles basin, is also conveniently located near the airport. At first glance, the unassuming parcel of tall grass and marsh may seem quiet but the folks who fight to preserve this ecosystem from developers have placed at least 215 bird species within its verdant confines. With little time to truly scrutinize the wetlands, I mostly observed common species like Black Phoebe, Yellow-rumped Warbler, and Red-winged Blackbird. However, one small shorebird winging through a tangle of vegetation got my heart racing, its distinctive profile one I’d only seen before in field guides and other people’s photos. Assuring Sherry we had something special here, I finally got my bins on a beautiful Wilson’s Snipe, my first ever! So Cal birding is always a blast, particularly when it involves new sites and new birds. For me, though, the best part was spending time with someone I only ever speak with online. It may not be your good fortune to run into Sherry on the birding trail, but you should check out the bird and wildlife ringtones, wallpapers, and mobile games she’s got cooking over at Conservation Calling. And if you ever have a few hours to kill in a layover at LAX, don’t forget about Playa Del Rey and Ballona Wetlands! Congrats on finally nailing that snipe! I went to AZ with Brad Schram (author of the So Cal guide) back in 2003. He’s an unbelievable birder and a great guy. Does Corey still have your scope??? No more snipe hunts for you! What happened to snipes in North America? When I spent a year close to Toronto / Ontario in 1987/88, snipes were common. I saw them over our house in display flight, they were on every grassy puddle besides the road in urban parks etc. during migration, I basically flushed them in every area that had a bit of grass and at least a minimum amount of water. 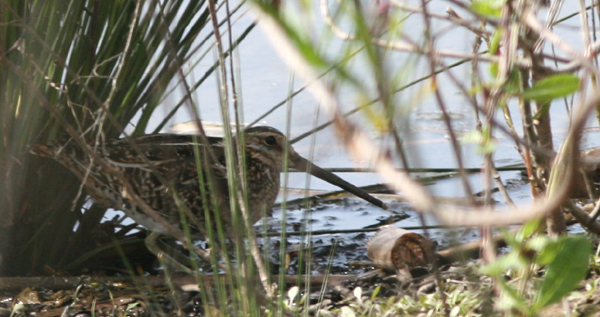 I have, however, barely seen a snipe in May 2005 or in my Michigan year 2006/07. Patrick, I’m afraid Corey became too attached to the scope. I had to take it back for his own good. Jochen, since my success rate with snipes has been so poor with this one exception, I can only surmise they’re all in Ballona Wetlands. My further conjecture is that there’s no such thing as an American Woodcock. Well, as this place seems to be rather smallish, I sure hope you’re wrong! Ever tried Crane Creek, Ohio in May? After all, if all the Snipe hang around Ballona Wetlands, the woodcocks have to use an alternative place, right? Can’t make it too easy for you east coast birders, or else the fun would be spoilt. Jack, you keep confusing me with my colleagues. However, I still hope to take you up on your offer one day! Parrots in Brooklyn Being Poached?